Sometimes when three busy musicians, all mutual admirers, take the next step and form a trio, new creative avenues open before them and the world of improvised music is richer for it. 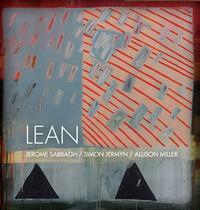 With Lean, an album but also a de facto band name, tenor saxophonist Jerome Sabbagh, electric bassist Simon Jermyn and drummer Allison Miller combine their formidable talents in a bristling set of original music. We hear their subtlety and breadth as players as well as their distinct compositional voices. Whether spontaneously creating, or drawing on and reinterpreting works from their own catalogues, Sabbagh-Jermyn-Miller arrive at a depth and beauty as a unit that defies easy categorization. “Comptine” first appeared on I Will Follow You, Sabbagh’s evocative 2010 trio date with Ben Monder and drum veteran Daniel Humair. The version in question was just once through the melody and out, though the trio would always expand on it when playing it live. That process of expansion continues on Lean. Miller’s colorful brushwork, Jermyn’s eerie water-like sounds, Sabbagh’s tenor lyricism and legato expression: it all grows out of the simplest of ideas, the “comptine” or French nursery rhyme.